This is the one job I don't enjoy. It is dusty, laborious and time consuming. If you have more than one horse, it will take a big chunk of your time. 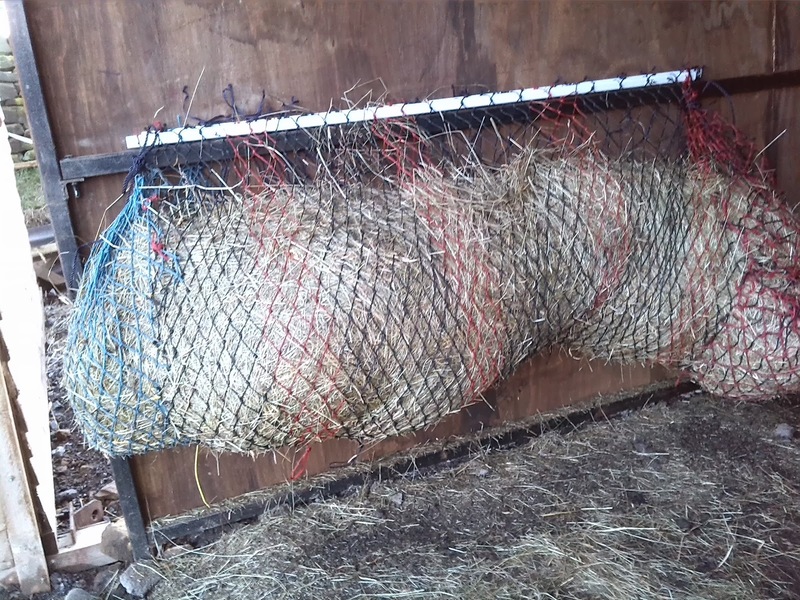 So I decided that I would make an easy fill, super quick hay net feeder for our horses. 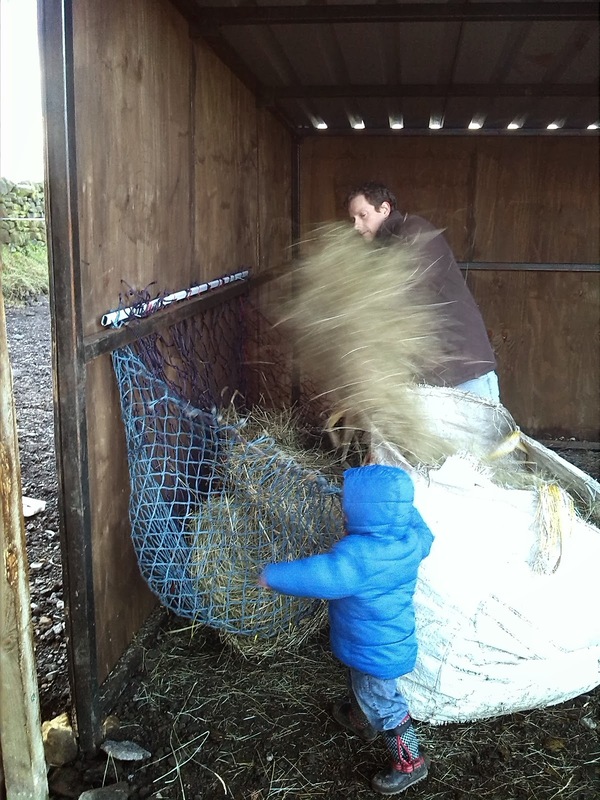 This feeder gives you the equivalent volume of 6 large hay nets, but only takes seconds to fill. Important Note - All of our horses are barefoot, which is why our nets can hang low. If your horse is shod, please hang the nets higher so that shoes don't get caught in the net. 2 x metal posts - these could be curtain poles or whatever you have to hand. We bought 1.8m / 6ft oval poles from B&Q something like this. Fixings: Our hay feeder is secured with bolts and wing nuts. I have since found this a little fiddly to align to fasten the feeder. I recommend that you use a couple of old straps or some brackets to fasten your poles back up again. I will add to the blog soon to show you my modifications. Large haynets x 6 or 6ft x 6ft of hockey net. I cut up my old haynets and tied them together. If you find it fiddly to tie them you could use small tie wraps. 1) Drill two holes in your poles, each 2 inch away from the end. 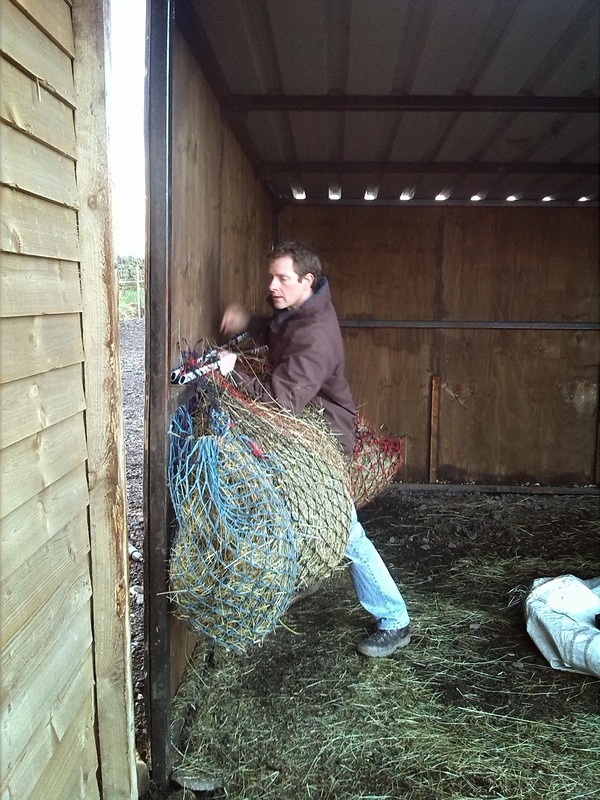 2) If you are using old hay nets, you need to cut the nets so that they are flat. Remove the metal rings and any tie rope. Tie together 4 nets so that they are side ways on, giving you more width than height. They should sit together in a grid of 2 x 2, to make a large rectangle. 3) Thread the top of the net net over one of the poles so that it is hanging down. Secure the ends with tie wraps through the drilled holes. This stops the net from moving. 3) Thread the other end of the net (the bottom) through the other pole and secure with tie wraps as before. 4) Take your other two haynets and cut them open so that they lay flat. These are the sides of your hay feeder. Put your poles together so that the net hanging down forms a bag. You will see that hay will escape from the sides. 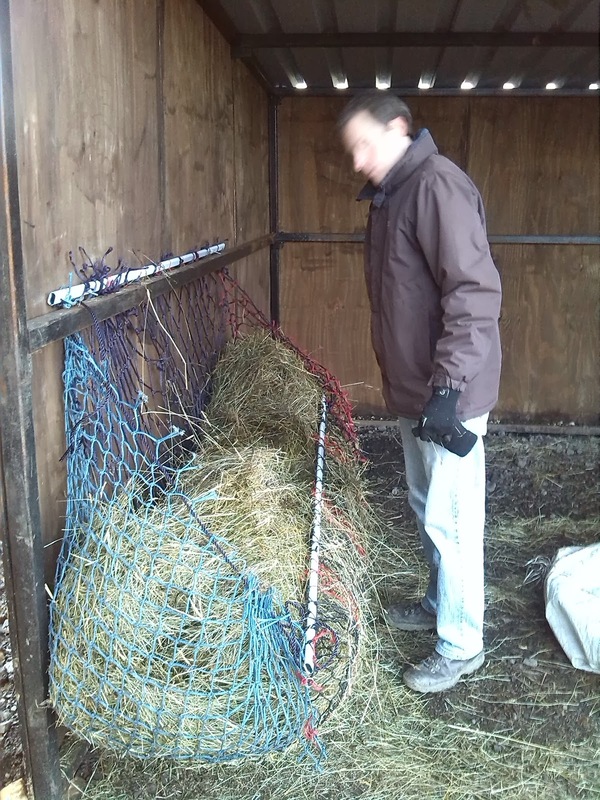 You need to attach your remaining nets to each end so that the hay stays in the net. Attach the nets length ways so that they give plenty of width so you can open your feeder wide to fill. You should now have a purse shaped, very large hay net attached to two poles. 5) Take the back / furthest away pole and bolt it to your stable wall / barn wall / field shelter wall. 6) Secure the pole nearest to you with your fixings. 7) The side nets can have rope from your old hay nets threaded through them to tighten up the slack. There you go, simply unfasten the front bar, open and pile in the hay. Fasten up again and voilà! Your horses will have lots of hay to munch and you will hay to munch and you will save oodles of time every day.